The latest data from the Florida Chamber’s Early Voting Dashboard shows that total returned vote-by-mail (VBM) ballots have reached nearly 922,800, while nearly 223,700 people have early voted. Total turnout is nearing nine percent. The early voting tally more than doubled over the weekend. On Saturday morning, 71,500 had early voted already. When Monday afternoon's numbers came in, 162,612 voters had cast their early ballots. The patisan return rate gap continues for VBM, with Republicans turning in 39 percent of requested ballots while the Democrats have turned in 32 percent. The latest vote-by-mail (VBM) numbers from the Florida Chamber's Early Voting Dashboard show that VBM returns rose to 491,236, or nearly 19 percent of all requested ballots. Voting by mail appears to be more popular among women, particularly Democrats. There are 681,744 Democratic women with requested ballots as compared to 555,246 GOP women, 465,918 GOP men and 390,103 Democratic men. When it comes to turning in their ballots, women from both parties have been more proactive. Democratic women have returned 113,972 ballots while Democratic men have turned in 70,622. GOP women have turned in 116,544 ballots while GOP men have turned in 106,406. 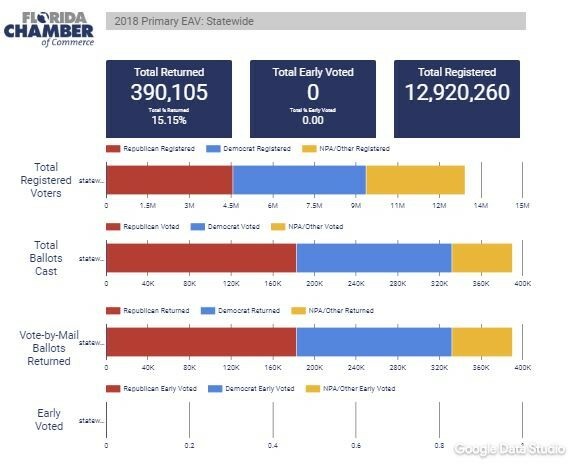 The latest vote-by-mail (VBM) numbers from the Florida Chamber's Early Voting Dashboard show that more than 390,100 VBM ballots have been returned, with a 15.15 percent return rate and a 3.02 percent overall turnout rate. 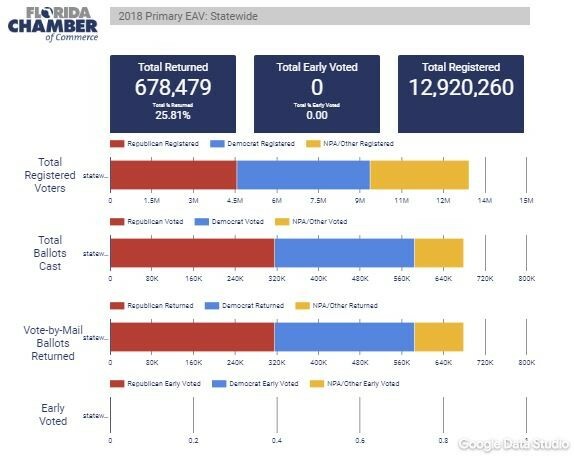 Republicans have widened their lead in VBM returns with GOP voters returning 18.3 percent of ballots while the Democrats have returned 14 percent. This is the largest gap between the party returns since returns started. The scale of vote-by-mail (VBM) is still not fully appreciated among many observers. Right now, over 1 in 5 Florida voters have requested a ballot for the primary election. Looking more closely, in 11 counties, over 1 in 4 voters have requested a ballot. The population of VBM requestors skews older, with 56 percent of requestors over 60, compared to just 37 percent of the total voter population. As a result, the counties with the largest retirement populations lead in VBM requests and returns. Nearly 328,600 ballots have been returned.